Hair Tip: Damp Bunning - Hairlicious Inc.
After moisturizing & sealing or after you've washed, conditioned, and air dried your hair, put your hair into a bun and you'll notice that your hair will remain moisturized for a longer period of time since all the hair is gathered together and tucked away from the elements (i.e. clothing, weather etc.). When your hair is in a clip, your ends are exposed or separated from each other thus allowing moisture to easily escape. Bunning is a low manipulative style that keeps the hair moist and protected throughout the day. I've noticed a difference when bunning as opposed to just clipping up my hair. My hair is more moist when in a bun. Plus, moist hair 24/7 is the key to length retention. I now damp bun everyday without fail with my headbands (just like the pic). Try it and see how it works for you! Hi. I always thought that pinning up you hair was bad because the clips would damage the hair shaft, and that bunning your hair when wet would cause it to rot. Also thought that wearing headbands would damage my hair line (which is seemingly receding btw). You're so right... Clips are bad for your hair!!! Also, pulling it back tight is bad for your roots! Just saying. This method has worked for me for the past ten months...July will make 1 year in transition...and also marking my "big chop!" Love, love, love this method, especially with Cantu Shea butter! @ Debs - I'm not bunning while it's "wet", I'm bunning my hair while it's damp, there is a difference. Even if you were to bun wet hair, it will not rot. 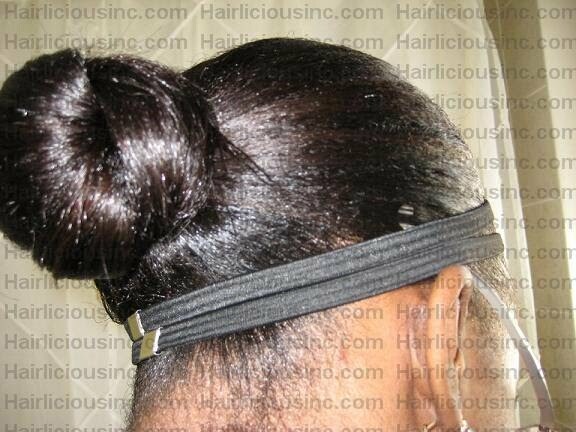 Hair bands that are stretchy & soft will not put stress on the hairline, so you should be fine. Just wondering what sort of hair bands you are using for the buns and pony tails. I want to wear my hair in these protective styles but am afraid that the hair ties will break my hair off at the pony tail. how do you put your hair in a bunn if you have short hair, I can put it in a ponytail, but what then? warning: do not, i mean, do not do this on soaking wet hair. my hair has been snapping off where i place the band... i notice that i wasnt letting my hair air dry enough and now in the front it looks as though i have had someone cut me so mlong bangs in the front. i am currently trying to "heal" the damaged areas but the only thing i can see is that im going to have to eventually chop of the damage. does bunning work on NL hair? I am currently trying this. My hair is ear length so I am able to do only make a small pony tail. I have experimented with putting the clip on buns over my pony tail but was having a hard time with color match. I finally got a pack of braiding hair and made my own bun by wrapping it around my pony tail. So far it is turning out to be a good protective style. How will your hair ever dry if its in a bun? if you damp bun everyday-do you wet your hair everyday or just apply more moisturizer? I had the same question @Gladys Olivia, but now that I think about it I guess you could just use a spray bottle to slightly dampen the hair. Water and glycerin is nice to use because glycerin helps retain moisture.